During the weeks I worked on the Bethlehem print, my emotional state was mostly calm and meditative. I listened to Orthodox and seasonal Christian music while carving and printing, and the swirls in the landscape I was printing felt watery and soothing. The Mecca print has had a different feeling for me, no doubt because I'm not as comfortable with Islam as I am with Christianity, and finding out that only Muslims can visit Mecca has exacerbated my conflicted feelings. In terms of artistic process, though, I'm starting to find this emotional state very interesting. In the long run I expect these feelings will become an integrated part of the work and I'm now curious to see how that evolves, how the work becomes different from my first vision of it even as I follow the "plan" (and a print like this has to have a plan). "I insist on revering Islam and its fearless heart. The fanatics will not deprive me of that victory." I feel that way right now about this print. I insist on respecting this religion that I do not understand. I insist on finding our common ground, our common humanity. I feel a certain defiance in working on this print right now. Defiance is interesting energy to make art with. Tonight I finished carving the next reduction for the print of Mecca, beginning the definition of the city streets and physical features. Unfortunately, in some research I did while I was working on this carving I was shocked to discover that according to Arab law all non-Muslims are barred from visiting Mecca. I find this prohibition both baffling and sad. I have visited holy sites of religions other than the one I was born into and have found it to be a powerful experience, always contributing to my understanding and respect for other beliefs. This ban seems like a terrible missed opportunity for connection and goodwill. I go forward with this print anyway, in the spirit of my initial intention, but finding out about the ban has definitely become a mental/emotional hurdle for me. Interesting. 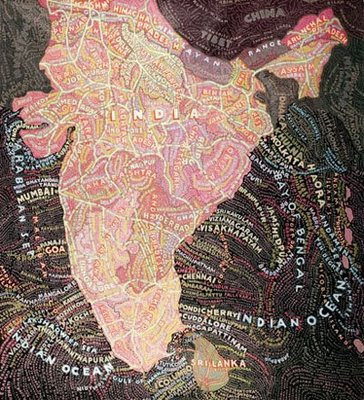 Map lover that I am, I'm absolutely enthralled with the maps of graphic designer Paula Scher. Well known for her typographic work at Pentagram, where she is a partner, Scher is also becoming well known for her large scale maps, painted painstakingly in acrylic on canvas. 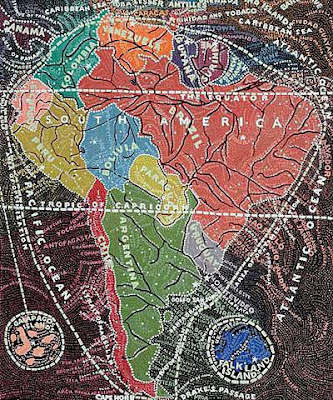 The Maya Stendhal Gallery in NY has been hosting an exhibit of Scher's most recent maps, which depict countries and cities from all over the world that have been a focus of attention in recent headlines. Scher also reveals that each map can take as long as 6 months to create, a fact that I find reassuring as I struggle with my reaction to the laborious nature of the woodblock maps I've been creating. The exhibit ends in two days, on January 27. ...if I were standing at the beginning of time, with the possibility of taking a kind of general and panoramic view of the whole of human history up to now, and the Almighty said to me, "Martin Luther King, which age would you like to live in?" ...Strangely enough, I would turn to the Almighty, and say, "If you allow me to live just a few years in the second half of the 20th century, I will be happy." - Martin Luther King Jr., the night before he was killed at the Lorraine Hotel in Memphis. This is a sketch for a possible woodblock print that I've been wanting to do for a couple of years. I'm hoping to work on it after I finish the Mecca print and before I start the Buddha/Lumbini print. This day of memorializing Rev. Dr. King always saddens me. Here's the result of several printing passes using the block in its first state. I wanted to "age" the paper a little, put sown some texture and define the white area (the Grand Mosque) clearly. Now I'll go back into the block and make some more cuts. from "The Subject Tonight Is Love"
Most of what I know about Islam comes through contact with a few American friends who are Sufi. Sufism is the mystical nondual form of Islam, and as such it has much in common with other mystical paths such as Christian mysticism and Zen Buddhism. Sufism extols direct experience of God, purification of the heart, and love, both human and divine. The poet I quoted above, Hafiz, is one of the most beloved poets of Persia (Iran) and his work expresses many Sufi teachings. I've been reading poetry by Hafiz and also Rumi these past few days. I've also been laying down a few first layers of color for the Mecca map. The Honolulu Academy of Arts, which houses the third largest collection of Japanese woodblock prints in the U.S., is running a new exhibit called "Prelude to the Print" which illustrates the role of drawing in the ukiyo-e / moku hanga process. The drawings displayed are preliminary drawings and hanshita (carving sketches) by many noted Japanese woodblock artists. The exhibit runs through January 20th. The second of the three "Birthplaces" prints I'll be working on is Mecca. The main reason I'm doing Mecca before I tackle Lumbini (Buddha's birthplace) is because Mohammed's birthday is traditionally celebrated on March 20, and I'd like the print to be finished by around that date. Given that the Bethlehem print took a little over two months, that timing seems about right. I know so little about Islam or Mohammed, or even about Saudi Arabia, so I hope that working on this print will teach me more. Mecca is sacred to Islam as the birthplace of Mohammed, who was born in around 570 CE. Mecca is sacred for other reasons also. One of the five pillars of Islam requires that all able-bodied Muslims should make a pilgrimage to Mecca at least once in their lifetime to participate in the Hajj, which takes place during the 12th lunar month of the Islamic calendar and focuses on rituals around a cube-shaped stone shrine called the Kaaba. The Kaaba, the most sacred shrine of Islam, is said to have been built by Abraham and his son Ishmael. All prayers by Muslims, wherever they are in the world, are performed facing toward the Kaaba, and thus facing Mecca. Judging from these facts, I'd venture to say that Mecca is the heart of Islam. So I've decided that the Grand Mosque of Mecca will be the focal point of this print. I will be doing this print by the reduction method, as I did the Bethlehem print, so here is the first reduction. The Holy Mosque will be white, the heart of the city and the heart of the print. My meditation teacher often urges us to bring the teachings and practices into our daily lives, so I'm always looking for ways to pause and reflect in the midst of the busyness of everyday life. One place I've found since moving to my new house is a certain busy intersection where I always have to wait for a signal before I can cross the street. I use the time waiting to pause, take a few deep breaths, feel my feet on the earth and quietly observe whatever is going on in that moment. Then, when the signal changes, I practice taking that calm awareness with me as I begin to move again. The day after New Year's is like that. It's like getting the walk signal after a nice pause and heading back into the downtown rush. So I wish for myself, and for you too, that your transition back to daily life is gentle and that you can keep with you in your heart some of the experiences of these past holidays to sustain you. Happy 2008. This little woodblock print took just a day, such a nice contrast to the two-month-long Bethlehem project.